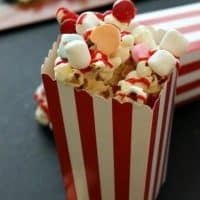 Celebrate Valentine’s Day with a fun party popcorn that is so easy to make even the kids can help! Valentine’s Day Party Popcorn! You might be thinking, oh no Valentine’s is Saturday and I have nothing done. Or class parties are tomorrow, what do I bring? Have no fear! This quick and easy popcorn mix is perfect for just the occasion. You can basically throw a bunch of ingredients together and it’s done. The hard part is waiting for it to set! I have a slight obsession with popcorn. Remember this nutella marshmallow popcorn or this peanut butter ball popcorn? Yeah I like it plain, salty, or sweet! How ever you want to give it to me, I’ll eat it! How do you like your popcorn? Place popcorn into a large bowl. Melt almond bark in microwave for 2 minutes. Stirring after every 30 seconds. 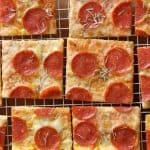 Pour popcorn onto a large cookie sheet lined with parchment paper or silpat. Melt red candy melts over double boil, stirring until smooth, then pour into a plastic sandwich bag. 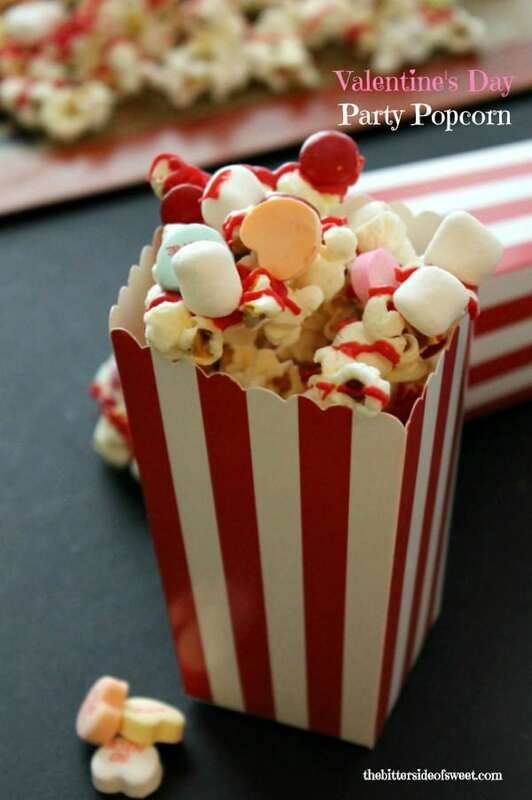 Clip the corner to make a small whole and pip the red candy onto the popcorn in zig zag motions. Sprinkle over the popcorn m&m's, marshmallows and hearts. Allow to set for 20 minutes. Caution: When pouring red candy melts into sandwich baggie the candy will be hot. 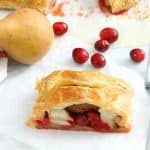 Allow to cool for a minute so you do not burn your hands, or use an ovenmit to hold the bag. Also when remember when eating popcorn the conversations hearts are hard! So you want to know about the giveaway? What does it have to do with popcorn? Nothing but I’m in a loving feeling type mood so I want to share this with you! 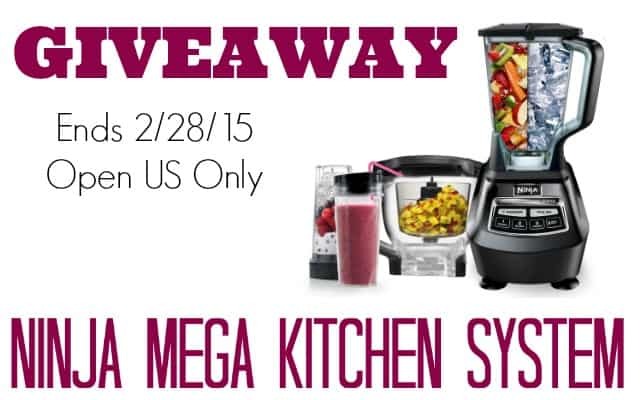 It is a Ninja Mega Kitchen System! Do you have one? I do not, but I would love it! It would be perfect for all the smoothies I like to make! How awesome if it were one of you who won it! Enter and GOOD LUCK! Hahha I have a popcorn issue too!. Popcorn is our favorite snack! Love this adorable version! Sweet popcorn! Yum! My favorite is caramel corn (with homemade caramel and stove top popcorn). This could easily become an obsession with me! Fun and festive! I want to try this! Love a sweet and salty snack, especially a eye catching one! Thanks for sharing this at the DI & DI Link Party. 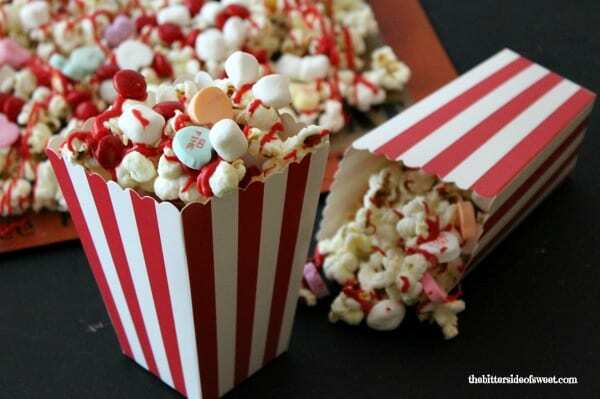 We will love this snack, a great Valentine Popcorn. 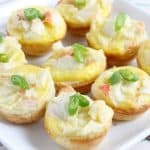 Hope you are having a great day and thanks so much for sharing you awesome post with us at Full Plate Thursday. Oh, yummy! Thanks for sharing at the Inspiration Spotlight party. Pinned & Shared. So cute and fun! 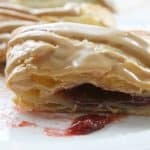 Looks delicious too 🙂 Thanks so much for linking up with us at Funtastic Friday! I also have a bit of an obsession with popcorn as a snack. Can’t wait to give your recipe a try. Congrats, you’re featured this week at the #ThisIsHowWeRoll Link Party.